Hello. My name’s Fatemeh Akbari Monfared. I’m the sister of political prisoner Maryam Akbari Monfared, a woman with two daughters who’s been imprisoned for eight years without a single-day leave. The woman who has filed suit against the Iranian regime officials in her effort to seek justice for our massacred sister and brothers. And this is why she was deprived of her weekly visits by her husband and children. 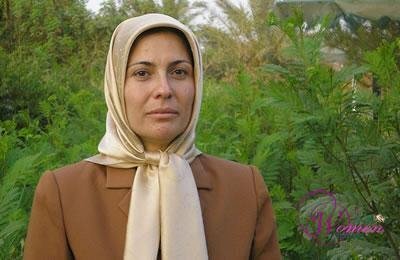 Her crime is being related to me, our other sister and brother, and two nieces who are members of the Iranian Resistance. We lost two brothers in the executions of the 1980s and a sister and a brother in the 1988 massacre. Her crime is her telephone contacts with us who have devoted our lives to our people’s freedom. I am four years older than Maryam. I also have a daughter. To join the Resistance and the fight for freedom of our people and family, I left her with Maryam. Now, like Maryam’s two daughters, she is deprived of the love of my dear sister, too. The point I’d like to make is that in our family, it was not grief and separations that mattered, but everyone’s courage and bravery. What we’ve learned from one another is being patient and remaining steadfast; standing up to the dictator teaches us how to stand firm. We have stood up firm to end our people’s pain and suffering by toppling this tyrannical regime. Yes, we are the continuation of a crimson path which is colored with the blood of the best children of our land and paves the way from inside the prisons towards freedom. Today, this path is paved most brilliantly than ever by the movement seeking justice for the victims of the 1988 massacre. My sister, Maryam, has risen to defend these sacrifices, and on the other side of the prison walls, I am echoing her voice. Both of us move on with the same goal and the same cause of freedom, and on this path, we do not hesitate to sacrifice anything.